Free Shipping Included! Rockin' Rider Lala The Ladybug Baby Rocker Plush Ride-On, Red by Rockin' Rider at My Pregnancy Place. MPN: 5-20432M. Hurry! Limited time offer. Offer valid only while supplies last. 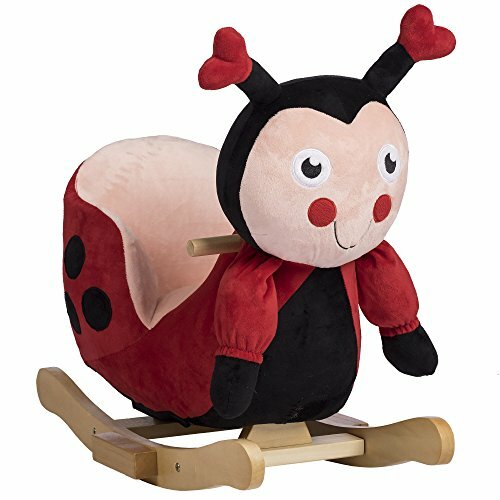 Lala the ladybug baby rocker is a soft stuffed plush rocking ladybug with a padded safety seat that assists with sitting up and maintaining balance. Lala the ladybug baby rocker is a soft stuffed plush rocking ladybug with a padded safety seat that assists with sitting up and maintaining balance. On the back of its head are 4 colorful shape buttons that play 4 lullaby melodies including the exclusive "I'm a little pony" song, "Rockabye baby", and "Twinkle, Twinkle little Star". your child will love the friendly, cuddly design. Other features include crinkle material in its antennae, rattles in both hands, natural wood rocking base with foot steps, and wood handles. Some assembly is required. Seat height is 9.5 inches. Requires 2 AA batteries included. Bashful is for ages 12-36 months and holds up to 40 lbs. If you have any questions about this product by Rockin' Rider, contact us by completing and submitting the form below. If you are looking for a specif part number, please include it with your message.